Have you ever considered the importance of prison phones? Keeping incarcerated individuals in contact with the outside world is immensely important to their re-entry into society – a smooth transition lessens the likelihood of repeat offenses. But phones cost money, even in prison. So who pays? 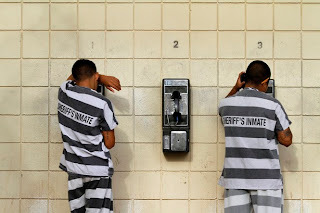 As I learned through coverage in the Los Angeles Times' and at the Leadership Conference for Civil Rights (LCCR) on July 25, it is not the incarcerated persons, but the families and taxpayers who must pay the unreasonably high costs of prison phone calls. And just what are the costs? This skit, put on by LCCR organizers helped me and a host of social justice interns from Washington, D.C., see not only the monetary costs, but the impact on communication between the incarcerated and their families as well. Background: This scenario features a mother of three whose husband has been incarcerated for five years. All of her children are in school and the oldest child is applying for college this month. Between the mother and her oldest child, both have been working overtime but there is one more application fee to be paid for. After groceries, rent, and transportation they both only have enough to pay for the last application fee. Operator: I have a collect call from John Wilson. Would you like to accept the charges? Loved one: *looks at money left* I’m sorry. I’ll decline the charges. Operator: Ok. Thank you. Have a nice day. Loved one: This is Mary, how may I help you? Loved one: *sighs* Sure. That’s fine. Operator: Ok. Ma’am you do realize that because this call is taking place in Virginia and is going out to Maryland that you will be charged a $4.95 connection fee? Loved one: Ok. I understand. Put him through. Impacted person: Hey, how is everything? I called you guys earlier. Loved one: I know. I know. I couldn’t accept the call just yet. I was picking the girls up from school. Never mind that, how are you holding up? Are you eating? Impacted person: Just missing you guys. I want to hear about the girls though. Have any decisions been made yet on schools? Operator: *cuts off Loved One* Excuse me ma’am, you have reached one minute on this call and your total is at $5.84, would you like to continue? Loved one: Yes. Thank you. Impacted person: Hello? Are you there? Loved one: I’m here. Sorry about that. Impacted person: Did you guys get my gift? I sent the girls new pom poms for cheerleading! Loved one: Yes. They loved it! We just haven’t had all that much time for cheerleading the past few months. Things have been tight. My mom is back in the hospital so I’ve been paying the neighbor to babysit. And college applications have been our main focus. Impacted person: I wish I could help. I feel so helpless in here. Loved one: We understand and we are working with what we have. Incarcerated person: Well is there anything I can do? Doesn’t she have a meeting with a recruiter soon? I could call my sister to give her some hand-me-downs and alleviate you of that. How big is she now? Operator: Excuse me, ma’am. You’ve reached 20 minutes. Your total amount is $12.95. This call will be ended now because it is long distance. In order to be reached, John Wilson will have to call you back. Thank you. Over time, the cost of prison phone calls add up. Many families can’t afford to keep in touch with the incarcerated person. The crazy thing is so much of the cost is unnecessary. Only about 40% of the cost is for the phone service and 60% is a kickback to the state government. This means that of the $12.95 charged to Mary, $7.77 goes to the state government and only $5.18 is for the service. Most states profit significantly from prison phone kickbacks, garnering over $152 million per year nationwide. Last week, the Federal Communications Commission voted to approve a new set of regulations to control the exploitative prison and jail phone industry. Groups like the Prison Policy Initiative have made extreme efforts to reform this collateral consequence.The regulations, detailed in PPI's blog, include rate caps and the elimination of charging higher rates for those who are hearing impaired. For more information on the prison phone predicament and to get involved, check out the Center for Constitutional Rights’ Prison PhoneRates page and the Campaign for Prison Phone Justice at www.phonejustice.org. Victoria is JPI's communications intern.